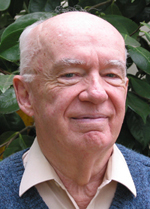 Tom Pettigrew, UC Santa Cruz research professor of social psychology, has been named winner of the American Sociological Association's Cox-Johnson-Frazier Award, the group’s highest award for contributions to the study of American race relations. Pettigrew joined the faculty in 1979 after teaching at the University of North Carolina and Harvard. He retired in 1994, but has continued to conduct research in social psychology. He has been at the forefront of studies of racial prejudice for more than five decades. An expert on black-white relations in the United States, he has also conducted intergroup research in Australia, Europe, and South Africa. In 2009, he won the University of California's Constantine Panunzio Distinguished Emeriti Award for research accomplishments since retirement. At the time, he said he’d published more in the previous decade than any other decade in his career. The Cox-Johnson-Frazier Award will be given at the ASA’s annual meeting in Seattle in August. The ASA Council first established the DuBois-Johnson-Frazier Award in 1971 to honor the intellectual traditions and contributions of W.E.B. DuBois, Charles S. Johnson, and E. Franklin Frazier. In 2006, the association voted to change the name to the Cox-Johnson-Frazier Award in honor of Oliver Cox, the award’s first recipient. It is given annually to an individual or individuals for their work in the intellectual traditions of the work of the three African American scholars. Cox, Johnson, and Frazier placed their scholarship in service to social justice, with an eye toward advancing the status of disadvantaged populations.